Connect the carburetor to the intake as close to the motor as possible and sot hat the gasoline connection is about eight inches below teh bottom of the gasoline tank. Clean the tank and the gasoline line thoroughly. Use copper or brass pipe, with a free passage of three-sixteenths inch. Do not use rubber tubing for gasoline connection. See that the ignition is properly timed and that the spark plugs are clean and the points have the proper gap. This precaution is most important becuase proper carburetion cannot be obtained if the ignition is faulty. After all connections are properly made, see the the air valve seats lightly, by adjusting the air valve screw (C). Adjust throttle stop screw (E) so that the throttle is slightly open. This will prevent the motor "dying" while making adjustments on the carburetor. The needle valve (A) should be closed by turning it as far as possible to the right, and then open it by turning it to the left, one complete turn. Retard the spark and open throttle about one-fourth. Adjust the needle valve (A). Turning it to the right decreases and turning to the left increases the supply of fuel. Adjust this needle until the engine runs smoothly without missing. This adjustment should be made with spark advanced about three-quarters and wide open throttle. If engine back-fires, the mixture is too lean. Turn the air valve adjusting screw to the right until the engine runs smoothly. If after two complete turns on the adjusting screw, the mixture is still lean, turn the needle valve (A) about one-tenth of a turn to the left. This furnishes a slightly richer mixture at both high and low speeds. If the engine runs rich at open throttle, turn the adjustment screw (C) to the left slightly, and the needle valve (A) about one-tenth of a turn to the right. After these adjustments are made tighten the lock nut (D) on the adjusting screw (C), and packing nut (B) on the needle valve (A). The carburetor should require no further attention. Note: - On account of sediment and water in fuel, we advise the use of the gasoline strainer. When you first start your motor it is very liable to backfire. This is because all the parts are cold and a readjustment should not be made until the motor is thoroughly warmed up. Flooding is usually due to dirt under the float valve. Take off the bowl cap and lift the float valve to flush out the seat. Some times the entire bowl should be removed carefully and cleaned thoroughly. When the float valve is seated, the top of the cork float should be level and 1/16" above the top of the spray nozzle on the 1/2, 3/4, and 2-inch sizes and 1/32-inch on the 1, 1-1/4, and 1-1/2 inch sizes. This will give the best economy and performance. Do not connect the air intake of the carburetor to the crank case unless a baffle screen of NO. 50 mesh brass gauze wire s used to prevent a possible backfire from entering the crank case. Danger of fire is very largely eliminated by placing under the carburetor a receptacle covered by a fire screen. Use all the exhaust heat possible about the intake pipe or manifold. If the carburetor is not to be used for several months, remove it, clean it thoroughly and put on it a thin coating of oil or grease. The carburetor should be attached as close to the motor as possible. 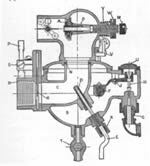 When this carburetor is used on a 2 cycle 2 port motor, a check valve must be used. note: this instructions are from Schebler Form 21, date uncertain.